Includes: Private transportation and English speaking tour guide. Departure Points: Avignon, Arles and vicinity; Aix/Marseilles and vicinity. Other departure points available, please inquire. 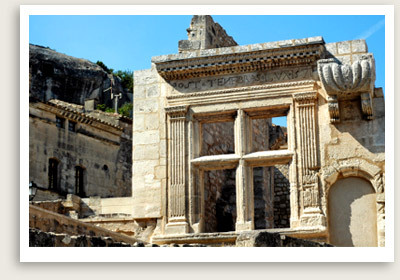 Les Baux-de-Provence is famous for its medieval hilltop castle and village carved right out of the cliff face. Cars are banned from the steep, winding streets, so you will have a brisk walk up the hill to the sights. In the afternoon, your guided tour of Provence will take you to the beautiful Senanque Abbey, considered one of the purest examples of Cistercian architecture. Today, a community of Cistercian monks still lives in this 12th century abbey, and it’s possible to visit the church, cloister, and dormitory. Next is your Gordes tour. Gordes is a beautiful medieval village with stone houses perched on the hillside. Gordes is right on the Lavender Trail, transformed with fragrant purple blossoms in July and August. OPTIONAL: Your private tour in Provence may conclude with a guided tour of an olive oil mill next to Gordes. Tour this family-owned business which offers a wide selection of Provencal specialties in addition to besides their homemade olive oil and assorted derivative products, including olive oil cosmetics. The family is very rooted in local traditions and is extremely welcoming. You will get a tour of the facility and get to sample the wares. A tasty ending to a beautiful day trip in Provence! ALL OUR SHORE EXCURSIONS, PRIVATE TOURS CAN BE CUSTOMIZED TO MEET YOUR UNIQUE GOALS. Tours perfect for families with kids, seniors and those with mobility issues.